A few weeks ago I had the pleasure of checking the progress as the Bookmobile had its wrap applied by Mike Bahantka, a graphic artist for Graphic Solutions in Painted Post. The deed was completed in the garage at Chemung County Transit where I work. Constantly referring to his artist’s rendering as a guide, Mike stood atop his ladder with propane torch in hand as he heated up each section of the design and smoothed it in place. Conforming the vinyl around the rivets on the vehicle was particularly tricky. The air punctuated with the ratatat of a power wrench, the sound of the torch is barely audible in the cavernous space. Our garage is spacious and well-lit, and the luminescent blue bookmobile stood out against the backdrop of white transit buses and yellow safety stripping. 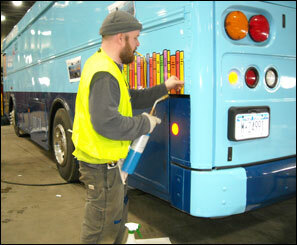 I’m glad to see “Big Blue,” as I call the bookmobile, covered with the primary colors of Tedd Arnold’s design. Now I’m anxious to see the inside and hear staffers Dianne Patchett and Kim Jones tell of the planned programming at Blue’s dedication from 5-7 pm on April 20th! Next → Next post: Baseball!